Fact: The opioid crisis is the worst addiction epidemic in American history, according to Time Magazine. These are staggering facts and figures that revolve around the three states that make up the Synod of the Trinity region. And they are not to be taken lightly. That’s why the Presbytery of Redstone went out of its way to create an Addiction Ministry Network that is raising awareness and providing resources to help combat the problem. In 2017, the Redstone group created a Lenten devotional titled “Into the Light: Join the Conversation” that aimed to get people in the church talking about the issue. Around that same time, it organized a worship service titled “Into the Light: A Service of Healing and Hope” that featured stirring testimonies by people who were touched by addiction, again with the goal of raising awareness toward the misuse of opioids. “We’re trying to establish the Biblical foundation of why Christ is calling our churches to reach out to people, particularly people recovering from substance use disorder,” said the Rev. Lee McDermott, a Redstone pastor who helped create the curriculum. “It tries to get churches to understand that dealing with people with an addiction is not any different than dealing with people with other health issues or diseases who need healing or people who are dealing with grief and loss. Rev. Sue Washburn, the pastor at Reunion Presbyterian Church in Mt. Pleasant, PA, hopes the curriculum will help congregations be more open about opioids and provide examples on how they can minister to their communities about this issue. “I find it helpful to have a framework for discussions that might be challenging or bring up strong opinions,” she said. “I’m hoping that churches in communities that have high addiction levels can use the curriculum to find ways to talk about the issue and how God may be calling them to respond. 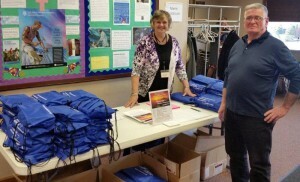 Lynn Mance and Walter Maynard helped pass out Recovery Bibles at a recent Presbytery of Redstone meeting. The curriculum draws off the same “Into the Light” metaphor as the Lenten devotional and corresponding worship service from two years ago. 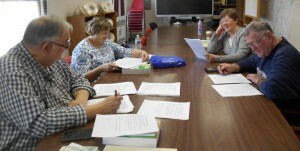 In connection with the curriculum, the Synod of the Trinity is teaming up with Lee and others who had a hand in the writing of the study guide to provide a four-part webinar on consecutive Thursdays in May. Scheduled for 7 p.m. from May 9 to May 30, the webinars will focus on four of the sessions highlighted in the curriculum. One of them will be on “Who We Are as God’s People,” which touches on the seriousness of the opioid problem in the region. Another webinar will focus on “Engaging Our Congregations within the Community,” which speaks to how the church can play a role in helping those affected by substance abuse. If you are interested in learning more about the Synod’s May webinar or want to attend, email Synod Communications Coordinator Mike Givler at mgivler@syntrinity.org. Lee, the yoked pastor at McClellandtown and Grace Chapel Presbyterian Churches in Fayette County, PA, is well-versed in this field. For 20 years prior to entering the ministry field, he worked as a counselor in a drug and alcohol rehabilitation center. 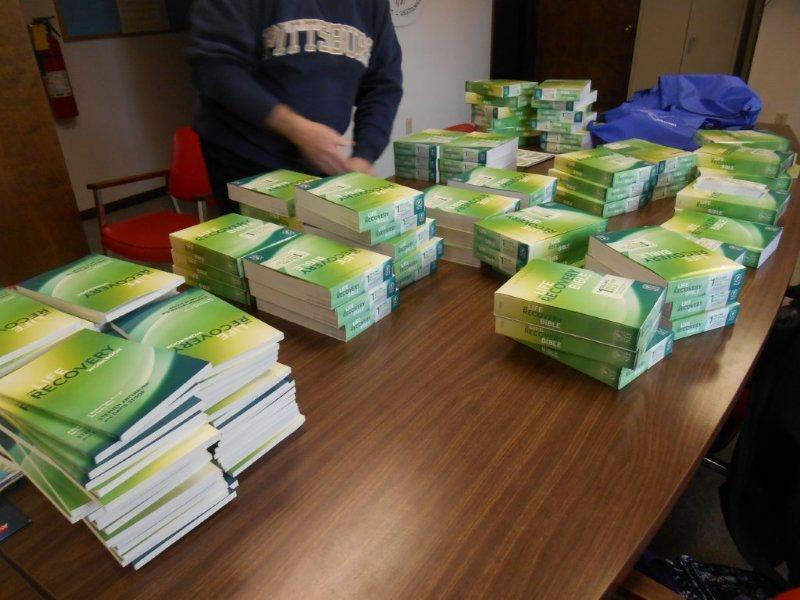 The curriculum came about after the Presbytery of Redstone received a grant from the Westmoreland Drug and Alcohol Commission that allowed it to purchase Life Recovery Bibles and corresponding workbooks for the churches in the presbytery. The curriculum helps the congregations better understand the Bibles and workbooks. Lee and Sue are two of nine people from the Addiction Ministry Network who contributed to the curriculum. Each person provided a variety of skills in writing, planning, research, editing, sharing experiences and knowledge and telling stories. The list also includes Linda Chicka, Elizabeth Comer, Daniel Foster, Duffy Greba, Lynn Mance, Walter Maynard and Alice Tondora. “We have a pretty diverse group of people,” Lee said of the contributors. “We have a doctor, a person in health care, a person who works at drug and alcohol (center) and a person who used to work at prevention. There are only three pastors on the list. We have a lot of different people giving us a lot of different perspectives in writing it. The Presbytery of Redstone received a grant from the Westmoreland Drug and Alcohol Commission that allowed it to purchase Life Recovery Bibles and corresponding workbooks for the churches in its presbytery. An opioid is defined as a pain-relieving drug made from the poppy plant, but they can also be created in a laboratory. The most common opioids are morphine, heroine and fentanyl, and most opioids are prescription medications used for things like dental surgery. The fact that the states that comprise the Synod region are among the highest in the nation in opioid-related incidents is staggering. But according to Lee, each region of the country has its own issues that it’s dealing with. No matter how you slice it, the opioid epidemic is one that needs everyone’s attention, and that commitment starts in the church. And, hopefully, that engagement will lead to a reduction and eventual end to an opioid addiction problem that’s of high concern for those in the Synod of the Trinity region.